Born on the Bathroom Floor, Airlifted to Hospital! 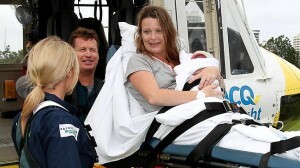 Home » Born on the Bathroom Floor, Airlifted to Hospital! This baby was born to achieve great heights quite literally. Baby Sabre Smith also has interesting timing. The tiny baby decided to arrive 3 weeks early into the world as the family was caught in the middle of a flood. Rachael and Joe Smith were at their northern NSW home cut off from everyone because of the raging floodwaters. It was precisely at that moment that she went into labour. It was approximately at 4.00 am that Joe banged on the doors of his neighbour Jodie Corlis. “He said, ‘Rach is about to have the baby’ … he was pretty agitated and worried,” Mrs Corlis said. The Smiths had contacted the paramedics but because of the floods around their property, it was impossible for the emergency crew to get to them. At one point they even launched a boat on the river, but could not reach them in time. Meanwhile, Jodie had come to help the frantic parents, although her only experience at birthing was her own children now 25 and 27. Baby Sabre was born on the bathroom floor at 4.22 am. Rachael even managed to catch the newborn and fall on the floor, says Jodie! “The delivery itself was beautiful and wonderful, and he came straight out into my hands and I put him on Rachael’s chest,” Joe said. Through the drama, a triple-0 operator guided them through the birth, and remained in contact until paramedics arrived at the property in a rapid rescue boat, about 7am. Two hours later a helicopter arrived to take mom and baby to the hospital after the paramedics realised it was too unsafe to take them on a boat. The new baby is Rachael’s third child. She says her maternal instincts kicked in knowing that she had little choice but to give birth then and there. She has had experience with floods before, though. In 2011, her vehicle was washed off a highway when she was three months pregnant with her second child. “I yelled for help, but no one could hear over the current’s roar. So I carefully crawled on to the ute’s roof,” she told That’s Life magazine at the time. She spotted a rope on a nearby tree and swing herself to safety. Joe is all praises for his wife. The couple’s older children were peacefully sleeping during the whole adventure.